About six miles southeast of the center of Guadalajara city you’ll find the trendy and artistic neighborhood of Tlaquepaque (“Tla-Keh-Pa-Keh”). A colonial town dating back to Hispanic times, today it has become the area’s boutique shopping district with trendy shops and restaurants lining colonial-style streets and alleyways, plazas, and gardens. Tlaquepaque is increasingly becoming a popular base for visitors to the area, situated about half-way between the city’ international airport and the historic center of Guadalajara. The town’s up-market arts and crafts center boutique shops and trendy restaurants line the picturesque colonial-style streets and alleyways, plazas, and gardens. The shops specialize in art and craft works from all over Mexico, with a particular emphasis on ceramics, bronze, sculpture, wooden furniture, papier-mâché, blown glass, and embroidered cloth. 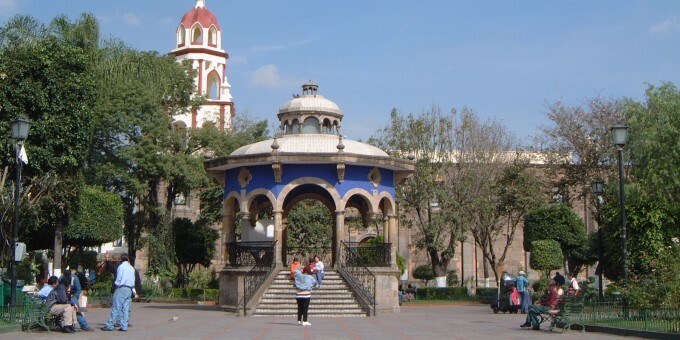 Although the old town has now been absorbed into the expansive reach of the Guadalajara metro area, Tlaquepaque retains the traditional structure of a small Mexican community: a central plaza (Jardin Hidalgo), a parish church, central market, and old-style central neighborhoods which retain their original colonial character. Its mansions and gentile style date back to the 19th century, when Tlaquepaque was one of the principal stops en route to Mexico City. It also holds an important place in Mexico’s history: The Plan de Iguala, which set forth the foundation for Mexican Independence from Spain, was signed at the house situated on the corner of Independencia and Contreras Medellin. The look, feel, and atmosphere around Tlaquepaque is distinctly colonial; there are various pedestrian areas featuring a wide assortment of charming cafés and restaurants—some with outside tables where you can watch the world go by. Street performers provide curbside entertainment while musicians’ instruments fill the air with the warm sound of Mexican music. This area fills up with lots of locals and visitors for Sunday lunch at one of the many fine restaurants here. The nearby artisan village of Tonalá, also known for its ceramics and pottery, makes for an interesting day-trip from here or Guadalajara if you enjoy learning about and buying crafts. 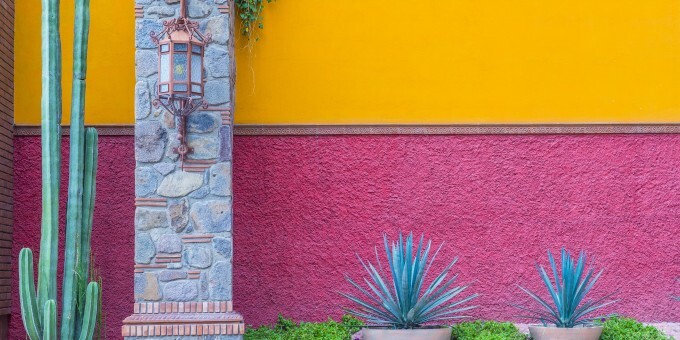 You won’t find the elegant façades and the curated collections of art and crafts that are available in the stores in Tlaquepaque: this is a working craft village offering outlet prices, but you’ll need a keen eye and be able to negotiate in Spanish, to walk away with quality art at a decent price. The colonial center begins at the Jardin Hidalgo, with its plaza, bandstand, gardens and church. Off here are several streets and alleyways that lead around the area of Tlaquepaque. The Museo Regional de la Ceramica (Regional Ceramics Museum) offers free admission and a glimpse into the different types and styles of ceramic crafted in Tlaquepaque. Like most museums in Mexico, it is closed on Mondays. Many of the old colonial mansions have been converted into excellent cafes and restaurants. Sunday lunch is very popular here with locals and visitors alike; live bands can often be heard playing through the open windows and often a traveling minstrel will “do the rounds” at a restaurant offering to play traditional Mexican folk songs in return for a small charge per song. There are many boutiques selling arts and crafts in Tlaquepaque. Some sell exclusive designs while others will offer more common, but high quality, Mexican arts and crafts. This is not the place you will find many bargains, but you can be assured of the quality and authenticity of the goods. By Air – The nearest airport to Tlaquepaque is also the main airport for flying into Guadalajara: Aeropuerto Internacional Libertador Miguel Hidalgo is 10 miles (16.5 km) south of Guadalajara. You can fly to Guadalajara from the US and other points in Mexico including Mexico City, Puerto Vallarta and Monterrey. Using ground transportation, it will take about 45 minutes to get into the center of Guadalajara; or about 20 minutes if you are staying in Tlaquepaque. For detailed information about flights and flying, see the Mexperience guide to Air Travel in Mexico. By Bus – You can travel to Guadalajara on a luxury bus from Mexico City – the trip takes around 7-8 hours. Luxury buses drop passengers off at the new bus station in Guadalajara, which is actually near Tlaquepaque. For detailed information about bus transportation read the Mexperience guide to Bus Travel in Mexico. By Car – Driving to Guadalajara / Tlaquepaque is very fast and efficient using the many high-speed roads that connect this region. See additional information about Driving in Mexico and Mexico’s Toll Roads on Mexperience. Buses – There are regular local buses from Guadalajara to Tlaquepaque and the journey takes around 20-30 minutes. Bus trips to local areas (within about 50 miles of Guadalajara) depart from the old bus station in Guadalajara, which is in the city center. You can take a local bus to nearby places including Lake Chapala (Chapala, Ajijic, Jacotepec). Connect to the Mexico Essentials section on Mexperience for information about traveling on Local Buses. Fiesta Internacional del Mariachi (International Mariachi Fair) – Scheduled to take place during the first two weeks in September. Mariachis from everywhere come to celebrate and play here. Fiestas de Octubre (October Parties) – These celebrations begin on the first Sunday in October and run right through to Halloween. Street parades, parties, celebrations, food, Mariachis and tequila all feature heavily. Consult the local tourist office or web site for details of this year’s event calendar. Ceramics Festival (Tlaquepaque) – Tlaquepaque hosts Mexico’s National Handicraft Trade Fair. This event is aimed at buyers (wholesalers) of Mexican Handicrafts and is ideal for those who buy Mexican handicrafts for export. Further information and dates for this year’s event is available online at: www.enart.com.mx. Exchanging Currency: Banks with ATM machines can be found in the central area of Tlaquepaque. For detailed information about exchanging and managing your money, read the Mexperience guide to Money in Mexico. The shops here specialize in art and craft work from all over Mexico, with a particular emphasis on up-market ceramics, bronze sculpture, papier-mâché, blown glass and embroidered cloth. Some shops sell exclusive designs while others will offer more mainstream, but high quality, Mexican arts and crafts. This is not the place you will find bargains, but every collection is carefully curated by the store’s owner and so you can be assured of the quality and authenticity of the goods you are buying. Tlaquepaque’s climate is spring-like all year-round. The winter months do become cooler in the mornings and evenings, so bring a sweater with you if you’re traveling at these times. The warmest times are April, May and June. The rainy season runs from June through to September. Rains tend to come in the afternoon, are relatively short and fierce and leave the evenings dry and cooled off.